There are spoilers and then there are spoilers. Up until this point most spoilers have been minor, especially when you compare them to what Jason over at MakingStarWars.net reported today. Even if you've been reading spoilers, you may want to reconsider reading on. This rumor is something that has been speculated before, but this is the first time we have a legitimate source reporting it. This rumor deals with the ultimate fate of a major character and how that scene plays out in detail. 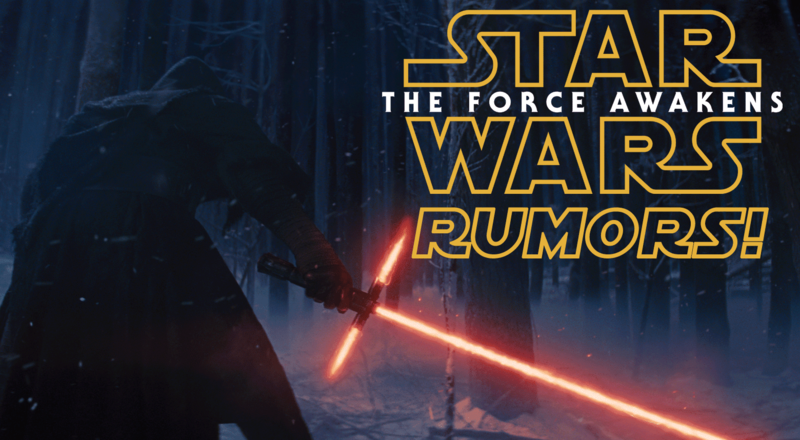 So if you don't want to know this major spoiler from Episode VII, then stop reading now. This is you official SPOILER ALERT! This sequence takes place on the ramparts of The Evil Castle. He decides to reveal himself to Kylo Renn. Finn, Rey, Chewbacca and BB-8 stop in their tracks. They watch as Han Solo confronts Kylo Ren. Kylo Rnn silences the conversation forever. Chewbacca lets out of a barrage of angry roars and laser blasts. Kylo Ren flees the scene. Stormtroopers file in and Finn and Rey are forced to flee. BB-8 and Chewbacca flee to the Falcon. Han Solo is never in a scene after this. Those are the facts. Wow. That is huge. We've speculated this may happen, but if this is how it happens then wow! Jason suggests that this scene may play out a bit like Obi-Wan's death in Episode IV. Which makes sense seeing as it seems Han may almost being playing an Old Ben type role (in that he helps get the next generation started on their journey, not the hokey religions part). Still, this sounds like a tragic scene and I'm sure there will be some tears in the theatres come December 18th, 2015 (assuming this is true). Its upsetting if han truely does die that lando won't be in this movie to have a last hurrah with him. It would be pretty cliche if Han Solo died, especially like this. And if this movie has a place called "The Evil Castle" in it, it's all over. They said "Don't worry star wars fans, its all in good hands." next day they through the WHOLE Canon away...So they can kill off anyone they wish, they do not give a dang about what SW fans care about OR what we would want. Lest we forget, Harrison Ford wanted Han Solo to be killed off as early as 'The Empire Strikes Back'. If Solo is indeed killed off in this one, I reckon Ford is the driving force behind the decision. It doesnt matter, none of this is canon. GL said they didnt use his stories for 7, 8, and 9. That means its just fanfiction. Just like the fan films that get made. I don't think that Disney would put out a movie that has Han Solo die in it at Christmas time. That would just be morbid. I hope this is not the direction Star Wars is taking…..
Steven Glenn, it IS canon. You need to start dealing with that right now. You have 10 months to do so. George Lucas sold away his rights to the universe and any say-so he had in the direction that the canon universe was taking story-wise. You need to wake up to that fact. It's not fan fiction, it's the New Star Wars Order in a post-Lucas universe. QuiGonZel - I think it's fair to view canon in two ways - GL Canon and Disney Canon. The fact of the matter is, nothing that takes place after the Disney purchase can be considered canon that's blessed by Lucas himself...and that's totally okay. And now, Disney is creating it's own canon using GL Canon as a starting point and that's also totally okay. You can not say "GL Canon doesn't exist anymore". When the purchase was made, The movies and the Clone Wars were defined as Lucas' Canon. I have a hunch that people are going to get all hung up over many things that happen in the new Disney canon (Many of the absurd things happening in the comics for example) but at the end of the day, it shouldn't really bother anyone. The reality is that GL's Canon is complete and totally finished. Anything that comes out from now on will be a part of the new Disney Canon and I'm totally cool with that. In fact, I think it's great that they have a story group that's wanting to make sure that everything matches up. However, I can imagine one drawback to Disney's approach that might pop up in a couple years or more though - What if the director/writer for Episode 9 wants to do something that they think will be great for the story but the story group comes in and tells them that their idea conflicts with what happened in the Princess Leia #2 comic? Who's going to win that battle? Its all not canon if it doesnt come from GL. He gave them the stories for 7,8, and 9. That shouldve been made. There was always canon and the eu. Canon was what GL made, and the eu was fanfiction. There were certain elements from the eu that was put into canon (Onderon and Selkath in TCW for example). But unless it came from GL then it technically wasnt canon. Anything disney makes is just fan fiction. It doesnt matter if they bought lucasfilm. GL thought they were going to use his story. It makes sense. GL created Star Wars he says what goes. They can make up their own stuff but it shouldnt be taken too seriously. Any way to find out how many films the original cast members have signed on for? That may shed some light on the validity of rumors like this. Seems a memorable and noble exit for the series' most beloved character - sacrificing himself to buy time for the others. I doubt that Han Solo would be killed off (at least so soon into the new trilogy) if Harrison Ford was willing to sign up for all the movies, but my suspicion is that he wasn't, so had to be written out in style. Gets my vote! Kill Han Solo! It's long over due and will add drama and depth through out the rest of the sequels. I love the moraly grey undertones of these rumors. The death of a main and beloved character will give more impact to the whole trilogy. Like a more personable journey for the other characters. This movie is darker than ESB, I guarantee it. This makes total sense if Kylo is indeed the son of Han. Being ready to sacrifice himself in a last attempt to redeem his wayward son, who it would appear from all rumors and speculation, is already too corrupted by the dark side to be saved, thus killing his own father. Han stealing Luke not to intervene and kill Kylo would also have great dramatic impact not only on this movie but the future installments as well. I too am also in the Kylo and Rey are Solo siblings. There's just too much floating around out there to think otherwise. Also the speculation of Rey simply being an alias of sorts for the first act or so, until her true family relation is revealed later on. Some have also rumored that Rey is in fact her middle name, with the often used, pre teaser name Kira being her actual first name. Kira Rey Solo and Kylo Ren Solo? I can see that working in the Star Wars universe without coming off as too cheesy, especially if they are twins like in the old EU. If it is indeed true that like does not stop Kylo from murdering Han, it would be a great jumping off point for VIII and IX for some very poignant, dramatic scenes with Rey blaming Luke for her fathers death and even possibly the corruption of her brother through inaction. All of that could be utter nonsense when the movie comes out, it's just my speculation on one possible scene from a movie we hardly know anything about so I'm probably way off. Either way, I'm excited to see what JJ and team have in store for us. George Lucas sold everything to Disney, they are the owners of the franchise, they determine what is and is not official canon through the Lucasfilm Story Group. Lucas has no say any more on what is canon or is not canon. Im just saying. They can put mickey mouse and donald duck in episode 7 but that doesnt mean its canon. I guess since they bought lucasfilm they can do that but we know its not really canon. GL created star wars, it was his story for 4-6 and 1-3. It only makes sense that we get his story for 7-9. Id rather have those stories. If they told him that they were going to not use his stories and cancel tcw when they offered to buy the company he probably wouldve been like "Guards!". Anyway. Its whatever. I was looking forward to the new movies until we found out that its not his story. It should be put on the same level as the eu if not lower. Steven Glenn - I think it's best just to think of two canons - GL Canon and Disney Canon. Even if Disney did use some of GL ideas, it still really wouldn't actually be canon dictated by Lucas since he's no longer a part of the process. I'm happy with accepting that Eps 1-6 and the Clone Wars are GL's definitive canon, and everything that Disney does from this point forward is their canon (that includes GL's Canon as a jumping off point). If they do a good job with Eps7-9, it'll be great. The only problem with Scott Thompson's post is that Disney can't just say that GL's Canon is no longer canon (although they would never do that). Bottom line is, there's GL's Canon that's set in stone and the new Disney Canon. Unfortunately Eps 7-9 can never be considered "GL's Canon" since he isn't writing those films. The thing is, most people don't really mind that at this point and argue that a fresh take is the best way to go. It would have been interesting to see what GL would have done with Eps 7-9. I hope they release his initial treatments one day. Yeah sorry for being negative before. I was in a bad mood. It would be great if it was just one canon. If they changed or added a couple things in the new movies thats one thing but it seems like theyre just making up their own story. It seems very unofficial. I dont get it. Ill probably still go see episode 7. But I wont be viewing it as canon. Shouldn't everyone be grateful that Star Wars is continuing? Well, Han might die and we've seen J.J. do stupid stuff before (like Kirk dying in Star Trek). But if the rumors about the tomb of Darth Plagueis are true, then we have to remember this line from Palpatine: "Darth Plagueis was a Dark Lord of the Sith so powerful and so wise, he could use the Force to influence the midi-chlorians to create life. He had such a knowledge of the dark side, he could even keep the ones he cared about from dying." I love the fact that STAR WARS WILL CONTINUE. I also have complete faith in what Disney is going to do with the New movies and everything ELSE that comes along.